Vuze converts filenames with quotation marks (U+0022) via method convertOSSpecificChars() in FileUtil.java. See https://github.com/svn2github/vuze/blob/....java#L327 . I am not 100% certain the aforementioned function is responsible for the issue, but it seems to be the most likely cause. 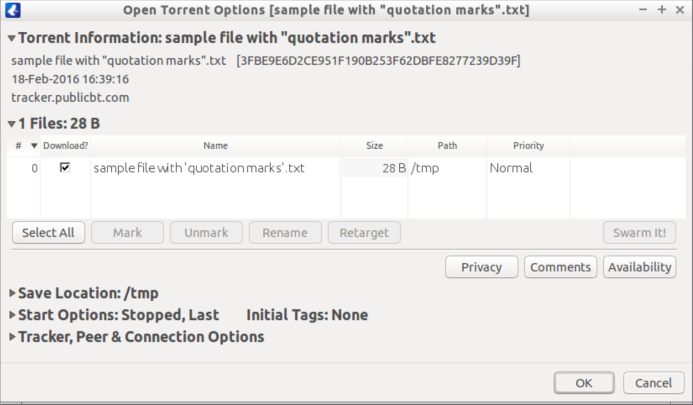 Can you send me an example of a failing torrent to paul@vuze.com? (02-17-2016, 10:31 PM)'parg' Wrote: Can you send me an example of a failing torrent to paul@vuze.com? 0000130: 756f 7461 7469 6f6e 206d 6172 6b73 222e uotation marks". 0000160: 7332 303a c44d 0397 adc3 6af8 0d7f 3fdf s20:.M....j...?. Tested the fix in v5.7.0.1_B20. Works perfectly! Thank you so much for fixing this so quickly! You're awesome! Current time: 02-05-2019, 12:06 PM Powered By MyBB, © 2002-2019 MyBB Group.